Blood vessels form an extensive network in our bodies. They are responsible for supplying oxygen and nutrients to all tissues and organs. This complex system arises from a limited number of progenitor cells which differentiate during embryonic development and form the first vessels. All the remaining ones develop from them, in a process called angiogenesis. This is the story of how angiogenesis became a key process to fight and cure cancer, without actually killing tumor cells. Curing cancer? Could this be? Well, it’s more complicated than that. For starters, virtually all cancers are different, as are their ‘personalities’. Although there are a few common traits, not all tumors of a particular tissue behave similarly. As a result, they usually do not respond to treatments in the same way. There are two different schools of thought on how to fight cancer: understanding each tumor as an individual case and fighting it in the best specialized and effective way possible; or discovering the mechanisms which are fundamental to all tumors, thus driving research to targeting and killing cancerous cells. Although the first option seems to be the ideal one, it may be utopic to pursue it in the current healthcare paradigm. Therefore, most research efforts have been focused on fundamental processes common to most tumor cells in order to target them and directly destroy the tumors. Almost 50 years ago, Dr Judah Folkman proposed that tumors can only grow when they have access to vessels. He viewed the tumor as a parasite: it hijacks oxygen and nutrients from its host to grow and thrive by making vessels sprout in its direction in an uncontrolled way (Figure 1). Dr Folkman also suggested that a tumor that is not vascularized would not grow more than a grain of salt, and it would not metastasize – spread its malign cells to other parts of the body –, making it easier to be removed. Most importantly, since angiogenesis rarely occurs in adults, he predicted that therapy against it would not damage normal tissue, and have virtually no unwanted effects such as those from classical chemotherapy and radiotherapy. It was the first time that a method that would kill the tumor without actually targeting cancer cells was suggested. This type of strategy would be very beneficial since cancer cells have high mutation rates and can become resistant to treatment. The theoretical potential of this new approach triggered a revolution in the scientific community. Maybe the key to prevent a tumor from growing, regardless of its origin, tissue and genetic profile, could be preventing the vascularisation of the tumor, cutting off its supplies. Or, to put it simply, to starve it. Over the years, this concept became widely accepted and raised pertinent questions: How can the tumor exert such power over the patient’s vasculature? Which molecular mechanisms can we interfere with to stop angiogenesis? Would the normal vessels in the adult be spared from this interference? Figure 1. Blood vessels sprouting (arrowheads). Reproduced from 3. When activated, the cells that compose the blood vessels (endothelial cells) become motile and invasive, dragging a row of dividing stalk cells that will become the future vessel, in a structure that resembles a tree. The cell at the tip decides where to go by sensing the environment and looking for growth factors – molecules involved in stimulating cellular growth, proliferation, healing and cellular differentiation. One of the most important ones, VEGF (Vascular Endothelial Growth Factor), activates a powerful migratory behaviour in the cell in which it binds to its receptor. This same basic mechanism occurs every time vessels sprout in the body, regardless of when and where. And yes, you guessed it, also in tumor vascularization! A tumor secretes immense amounts of VEGF into the nearby tissue, inducing many blood vessels to sprout towards it, establishing a powerful source of nutrients and oxygen. Most antiangiogenic therapies developed interfere with several steps of the VEGF signalling cascade. The prime drug approved by the US Food and Drug Administration for clinical use is an antibody that binds to VEGF and prevents docking to its receptor. This antibody is already being used as therapy in cases of metastatic cancers, such as lung and breast cancer and glioblastoma – primary tumor in the brain –, and many other antibodies are currently in clinical trials. I bet you’re thinking: If this therapy works as well as it sounds, why do we still use the aggressive old school chemotherapy and radiotherapy for cancer treatment? Well, let me burst that bubble, there are still some problems! Chemotherapy still needs to be administered in order to kill all the tumor cells. Furthermore, some patients are unresponsive to this strategy and it often interferes with natural processes such as wound healing and heart and kidney function. This reflects the importance of physiological angiogenesis in the adult, and the extent of our ignorance of it. Another relevant side effect is the high incidence of dementia – decline of mental ability – in glioblastoma patients. It hints that this pathway might directly affect the central nervous system or that it affects healthy vasculature in the surrounding support tissue. All in all, this serves to show that we need to backtrack and further our knowledge of these mechanisms, not only in cancer biology, but also in normal physiology. Research is now focused on identifying and understanding the molecular machinery specific to cancer related angiogenesis, so that its inhibition minimizes side effects, as well as understanding angiogenesis in the developing embryo and adult. For this purpose, researchers use animal models and patient samples to integrate knowledge of the molecular principles of vessel growth. As Dr Judah Folkman wrote, back in 1971, “(…) the mechanism by which tumor implants stimulate neovascularization must be well understood before therapy based upon interference with angiogenesis can be advised”. For now, we first need to understand vessels. Only then, can we make tumors starve! 1. POTENTE M, ET AL. (2011) BASIC AND THERAPEUTIC ASPECTS OF ANGIOGENESIS. CELL 146(6):873–887. 2. WÄLCHLI T, ET AL. (2015) WIRING THE VASCULAR NETWORK WITH NEURAL CUES: A CNS PERSPECTIVE. NEURON 87(2):271–296. 3. GERHARDT H, ET AL. 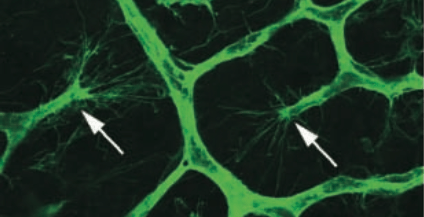 (2003) VEGF GUIDES ANGIOGENIC SPROUTING UTILIZING ENDOTHELIAL TIP CELL FILOPODIA. JOURNAL OF CELL BIOLOGY 161(6):1163–1177. Marta Oliveira is a PhD student at the Max Delbrück Center for Molecular Medicine in Berlin, trying (!) to understand vessel morphogenesis and homeostasis, using the zebrafish model.